The SKRM-100 Subkick is a low-frequency capture device that picks up the low frequencies (100Hz-2000Hz) that a normal microphone can't. 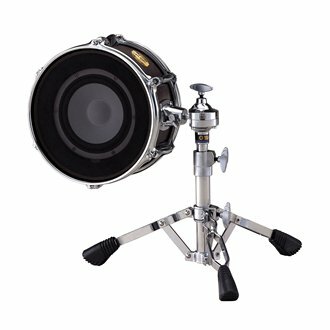 When used in conjunction with a normal internal microphone (for the attack), your kick drum has a jaw-dropping bottom end like you've never heard before. The Subkick consists of a 10" x 5" birch/Philippine mahogany 7-ply shell housing a 16cm, 50-watt low-frequency driver cone. The Subkick also works effectively with floor toms, bass guitars, low bass, etc.